Lydian Blosson, Abby Rosebrock, Layla Khoshnoudi, and Rachel Lin in Women. BOTTOM LINE: A hilarious, interesting, and entertaining mash-up of Girls and Little Women. The TV show Girls has become such a nexus in our culture, of either ire or admiration, that it has spawned parodies with artistic merit in their own right. Women uses Girls as a lens to explore and expose the hidden hilarity of the book Little Women. 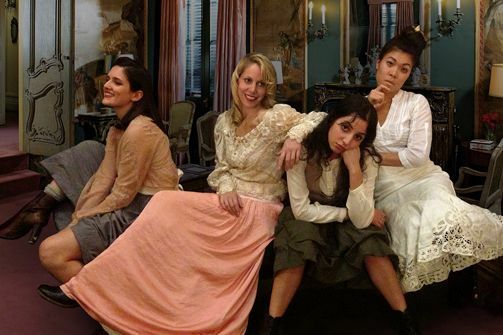 Playwright Chiara Atik clearly wrote the piece out of fascination with both Girls and Little Women; playing one off the other to hilarious effect that doesn’t come across as cruel. Women translates the characters of Girls directly into the characters and plot of Little Women. Hannah Horvath becomes Jo Marsh (Layla Khoshnoudi), Shoshanna Shapiro becomes Beth March (Rachel Lin), Jessa Johansson becomes Amy March (Lydian Blossom), and Marnie Michaels becomes Meg March (Abby Rosebrock). Far from awkward, these added personas seem to mesh perfectly with the original Little Women characters. This is possible because the Girls characters have become tropes in our society, so much so that we can label a character or a real person as a ‘Hannah’ or ‘Jessa’ effectively. It is also possible that Lena Dunham really is the voice of our generation; pulling these tropes from the zeitgeist before we even noticed they had congealed. Besides the translation of characters and changes in language to match these new personas, the plot of Women mirrors that of Little Women very closely. The play opens with the March sisters positioned around Marmie (Vicki Rodriguez) reading a letter from their father. The sisters lament their father’s absence, while Beth lets out several small coughs. While very subdued, knowing that Beth will die of illness in the original story, the audience is roused to hysterics. Beth’s coughing or mentioning that she doesn’t feel so well becomes a running gag throughout the show. Out of boredom, Jo nags her sisters into putting on a play, but with one major difference from their usual living room productions: a real man. This childhood fun comes to a swift end when the March family must find money to pay for a train ticket for Marmie to visit their ailing father in Washington D.C. The March sisters spread out to raise money for the trip in their own ways. Amy and Meg try and budget, and Jo sells her hair. However it is Beth who brings in the money from their rich, racist, neighbor. Beth falls terribly ill, amid much laughter, and the sisters are forced to make tough choices. When Beth does finally expire, Jo complains to Marmie that she feels left out and devoid of purpose. Their mother sends Jo to be a governess for an acquaintance in New York where she flourishes gaining real life experiences to fuel her writing. By chance she bumps into Friederich Bhaer (Stephen Stout) who introduces her to his literary friends, and takes her to the Lower East Side for a 'rave.' Meg sends several letters to Jo, which leads Jo to believe that she must return home to join her family. Meanwhile Amy has sojourned to Europe, adventuring through her own ‘rave’ until she connects with their old neighbor Laurie (Zac Moon) who had a thing for Jo. Jo returns triumphantly to her family, only to feel a surprising jealousy when Laurie and Amy return from Europe as a married couple. As the March family prepares for Christmas the sisters reflect on their lives, their choices, and and their adventures. The play closes with a not terribly successful attempt at a cast and audience dance party to Robyn’s "Dancing On My Own." Dressed in a minimal set, utilizing simple lighting, and almost too frequent transitions in low lighting and music, this play is more a collection of sketches held together by a thin plot. From a theatrical standpoint, the piece lacks many of the requirements for a strong play. The plot and characters are poorly developed, relying for the most part on a previous understanding and familiarity for both. The ‘climax’ of the piece comes early on with Beth’s death, and it fails to match that level of emotional intensity as it continues, causing the audience to mistake several transitions for the ending. The acting remains presentational without any deep or moving moments. However, in this instance, all of those elements work wonderfully. This is not a play, this is a pop culture riff on an established and loved literary classic. From the first line each of the sisters utters we know exactly which character from Girls they are inhabiting. And the jokes land without the audience becoming mired in emotional baggage from the characters. Women is engaging, entertaining, and absolutely hilarious. Despite its fast pace, Women takes every opportunity to make a comedic comment on Little Women, Girls, and culture at large. The performers are wonderful in the personification of the March sisters translated through the characters of Girls. For a great evening of laughs and insight Women delivers.